For the people who didn't experience pimple wouldn’t know the pain. 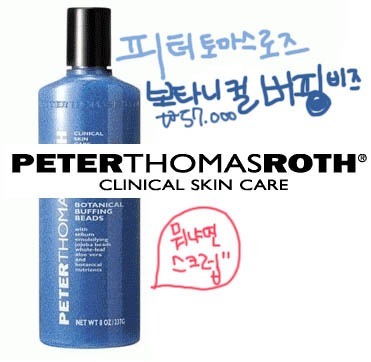 I will introduce to you guys PeterThomasRoth. I tried using a mask for this brand. My friend bought me because she saw my face with pimples before. But now I don't have any. However I tried using it for 2 weeks. One of blog follower told me her problem on pimples and I send her this product that I was using. She sends me two messages per week thanking me that it really works. This is for sensitive skin type. If you have normal skin type and you don't like the thick scrub than I recommend this type. The reason why it is dangerous to use any scrub is because it might worsen the pimples by rubbing your skin to hard. For the pimples you need other special kind. There aren’t any cosmetics that could hardly clear out any pimples. It is hard to do so. So if you are spending too much money on cosmetics don’t because it doesn’t really work on removing the pimples completely. First of all if you have pimples you have to remove the keratins first so other cosmetics absorbs well. This have really tiny kernels so the stimuli is much less comparing to other brands so it is just perfect to use. The price is little bit expensive but it is 237ml so have to be thankful to that. There is no stimuli and there is some bubbles but don't forget there are some kernels so don't rub too strong. Also for the black heads it doesn’t remove all but can care for it and makes the nose surface smooth. After washing your face and doing the steam towel works better for the scrubbing. The feeling isn’t that clean but don’t use foam to wash your face. Wash gently with water and pay attention more to basic skin care.